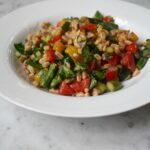 This salad was born out of the abundance of farro I have in my pantry. It’s become a bit of an obsession. Luckily, this salad has become my go-to for the summer. Full of colorful veggies charred up on the grill and tossed with a smoky garlic dressing, it’s hard to deny how perfect it is for the season. There are countless ways to switch up the vegetables used in this salad. Whatever is on hand or at the farmer’s market will surely be delicious. I like to enjoy this as a meal, topped with some sort of grilled meat, fish or tofu. But this is also great served as a side dish. Bring a large pot of water to a boil, season with salt and add farro. Cook according to package, until soft and chewy. (I like to use Trader Joe’s 10 minute farro which is pre cooked before being packaged, it saves time). Drain and cool to room temperature. Heat grill to medium and place a grill basket on grates. Combine diced vegetables, garlic cloves, olive oil and celery salt in a large bowl. Toss to evenly combine. Allow basket to heat before adding vegetables. Cook for 15–20 minutes, stirring occasionally, until vegetables are softened and slightly charred. Remove vegetables and allow to cool. Remove garlic cloves from vegetable mixture and mince into a paste. Add garlic to a small bowl along with Dijon mustard, olive oil, vinegar, pepper and salt (go heavy on the fresh cracked pepper, the more the better).Whisk to combine. Set aside. Combine farro, grilled vegetables and chopped baby kale. Stir in basil and dressing, toss to combine. Serve at room temperature or chilled. Keep refrigerated in an airtight container for up to 5 days. tried this tonight, didn’t have farro, but used couscous. Also sauteed some morels we found yesterday and added later. Very good, thanks Lauren! Hi Scott, morels sound like a delicious addition! Glad you enjoyed it!